Our Abpromise guarantee covers the use of ab31875 in the following tested applications. Has strong antimicrobial activity against E.coli ML35P N.cinerea and weaker against S.epidermidis, S.aureus and group b streptococcus bacteria. Active against the fungus C.albicans. No activity against P.aeruginosa (PubMed:11113131, PubMed:11034317). Highest expression in liver and to a lesser extent in heart and brain. Low levels in lung, tonsils, salivary gland, trachea, prostate gland, adrenal gland and thyroid gland. Secreted into the urine. 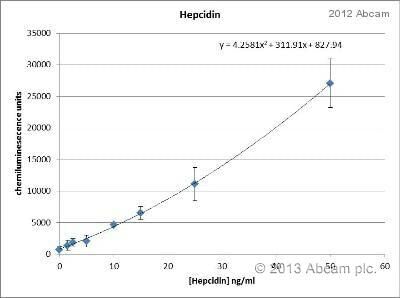 Belongs to the hepcidin family. Review text: Used in conjunction with ab30760 at does dependent concentration as a positive control.